I have a feeling I’ll catch some heat on this. However, before you throw stones at me, read the whole post. For years, I’ve been traveling on planes listening to screaming, misbehaving and crying kids. I must admit something very dark; I hated kids on planes. Just the sight of them made me cringe. I would spy them in the waiting areas and try to judge how misbehaved they’d be and what my odds were they would be sitting within one row of me or worse, next to me. The slamming stopped for a few minutes and I commented to the guy sitting and reading his newspaper. (Note: he hadn’t moved and, to my amazement, was still calmly reading.) “Do you believe this?” His response? “I’ve got four kids at home. This is nothing. I honestly don’t hear a thing.” I couldn’t believe his response and thought for a moment, he might have been their father; you know, a dad who travels with the family but acts as if he doesn’t know them. As for me at the time, I never thought I could deal with kids on a plane. That is, until my wife became pregnant with our first child. I knew, at that moment, I was going to have to grow up and get with the program. One thing I was sure about was 90% of a child’s behavior on the plane was in direct proportion to the effort put forth by the parents. Yes Mom and Dad, your children are your responsibility on planes or in hotels or anywhere else for that matter. Ignoring them in your own home is fine. However, ignoring them while they slam my tray table isn’t. Fast forward at least eighteen years. I now have two children under three years old. Both are avid flyers. My wife and I have, over many flights, put together a list of things we do and bring to make sure we have a good flight, not only for us, but for the people around us. It’s not a foolproof plan, but it’s pretty good. So, here goes. Kill Germs. Airports and planes are dirty. Bring disinfectant wipes and wipe down everything around your child on the plane; arm rests, tray tables, wall, window shade – everything. Carry Purell and wipe/disinfect their hands and yours regularly. OK, germs killed. Bring extra supplies. The diaper bag has to be filled, complete with any supply that might ever be needed for any possible reason. Extra diapers and supplies (30% more than you think you need – just in case of delays), paper towels, a cloth towel just in case you have to mop up a spill, plastic bags and ziplock baggies and an infinite supply of wipes. Bring a little air-freshener too. Trust me, you may be used to your little-one’s spit-up smell, but everyone around you won’t appreciate it. Keep ‘em busy. Children’s attention spans are short at a young age. I plan the 15-minute activity list. You should have one activity per 15 minutes. Keep them busy and they are less likely to aggravate you and the other people on the plane. Activities can be repeated, but only once an hour. For us, these include: crayons on coloring books, regular hard picture book, sticker book, etch-a-sketch mini and one of those books with the special marker that reveals hidden pictures as you color. Go ahead, watch TV. Here, television IS your friend. For longer flights, get a portable DVD player or something where you can play Barney, the Wiggles or whatever else you child likes. Popping Ears. Infants cry during take-off and landing because their ears hurt. So, make sure they’re drinking a bottle during those times to alleviate their ear-popping pain. It has worked like a charm for both of my kids. Extra clothes. Bring extra clothes for the kids…and for you. Sometimes, children get sick, so plan for it. Sometimes children get sick on you which my wife learned on one flight when my son threw up on her. From then on, we’ve each carried an extra t-shirt with us, just in case. Thou shall not kick. 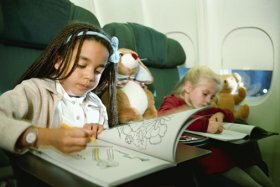 If your child is a fan of kicking the seat in front of them (why do they do this? ), take off their shoes. One kick and it will hurt and they’ll stop doing it. Hear no evil. No matter how well-behaved you think your kids are, they may cry. So, as soon as the flight attendant comes around offering earphones, offer to buy a set for each of your seat-mates. On our last Continental Airlines flight, they were being offered at $1, so I automatically bought one for the five people around us. One man kept saying “you don’t need to do that” but for a buck, it was a good insurance policy, just in case. Thank you and Sorry! Sometimes your children are going to misbehave. It happens. Yes, they are just kids (Okay? There, I said it.) Or, they’ll be sick or something just won’t go as planned on the plane. You’ll make a few people miserable. You won’t want to, but you will. When we fly with our children, we carry a dozen gift cards (from Dunkin’ Donuts and Starbucks). Most are for $10, but a few are for $50. We use these as “thank-you” and “I’m sorry” for people that have either helped us (like the flight where my wife was flying alone with my infant daughter and flight attendant held my daughter when my wife had to use the rest-room.) On a flight that was delayed for three hours ON THE RUNWAY, our daughter spilled her drink on the man next to her. It was just juice and she didn’t mean it, but she was fidgety. He wasn’t upset, but I felt I should at least pay for his dry-cleaning. He didn’t want to accept anything but was pleasantly surprised at the gift-card. Dads – this one is for you. Your wife has enough to deal with so help her. Help her even more than you normally would. Take turns taking your children to the bathroom. Do more than your fair share. Traveling with kids can be fun. My daughter and I love to look out the window on take-offs. We love to look at the clouds. ← Future airline fee ideas – just for fun. I’ll make sure to pass them on! Hey John, long time no chat. As a fellow avid traveler parent, I agree with your comments, and am not sure why you expect flack for them. They are dead on. And great tips. I too learned the hard way about bringing a change for the parents as well. And in my case, my seatmate was amazingly nice about spending 3 hours next to me and my puke stinking child. Wish I had those gift cards with me. What a great idea!